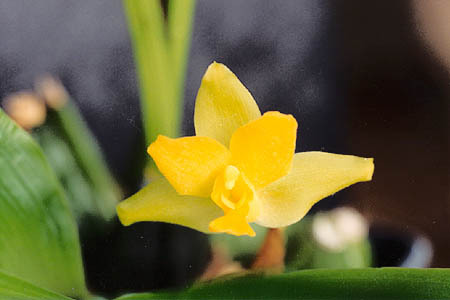 The Lycaste orchid genus contains very showy orchid flowers, usually triangular in shape because the sepals are longer than the petals and the petals face forward rather than sideways. They have conspicuous pseudobulbs with thin, veined leaves at the top. Flower stems have a single flower each, but you can get many from each growth. (The flower stems come from the base of the pseudobulb.) Flower colors include yellow, white, orange, green, red, and purple, among others. Many of these plants are fragrant orchids. Care is similar to the related Anguloa. They like intermediate-to-cool temperatures, 65-75°F (1-84C) by day, dropping by 10-15°F at night (6-8C). Water as they approach dryness; during the growing season they hate to dry out. There are deciduous Lycastes that will drop their leaves after flowering; after bloom care for these requires a dry rest, with just enough water to prevent the pseudobulbs from shriveling, until they start to grow again. A relatively fine potting mix, such as 50-50 sphagnum moss and fine-grade fir bark, works well. Go finer for terrestrial species (with fuzzy roots) and less fine for other species. High humidity is good; I recommend 70-80%. You can set a timer to raise the humidity as high as 100% once or twice a day, if you grow your orchids where this won't rot the house (such as in a greenhouse or orchidarium)! Provide intermediate-to-bright light. 1500-4000 footcandles works well, but it varies with species so you'll need to experiment.